We had a good flight from Dubai to Budapest, a large part of the journey took us over the snow-covered mountains of Iran; the skies were clear and we had a fantastic view the mountains themselves and lakes and villages scattered through them. 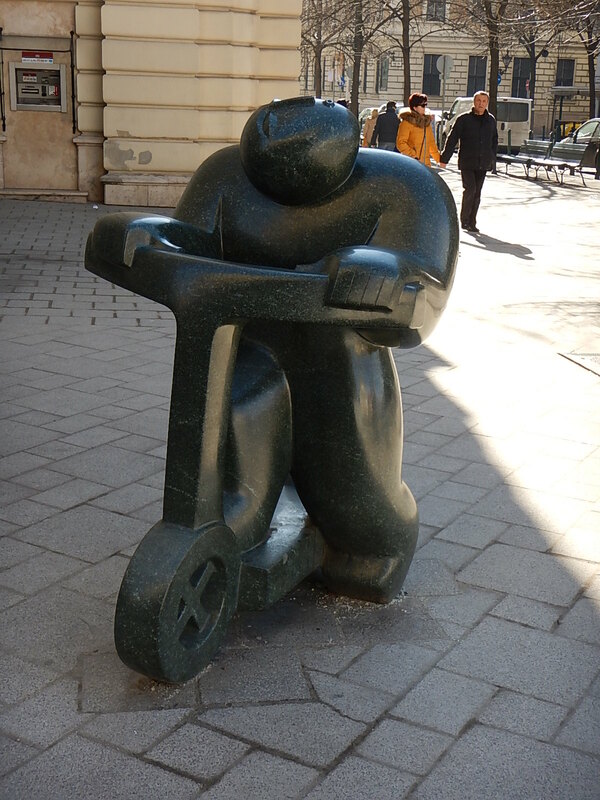 We arrived in Budapest in mid-afternoon and took a taxi to our hotel on the Pest side of the river; the outskirts were quite bleak with derelict buildings and lots of drab soviet era housing blocks, not very promising for a city break! Once we had checked in and freshened up we put on our jumpers and coats (strange to be wearing socks again!) and went for a walk in the immediate vicinity of the hotel looking for somewhere for an early supper. The neighbourhood felt more historic and we found a small, traditional restaurant opposite the Academy of Music where we tucked in to Goulash and noodles. We had had an early start, and had gained 4 hours so back at the hotel we admitted defeat and went to bed. We woke up to lovely spring morning, clear skies and crisp cool air, a lovely change after weeks of heat and humidity. We had planned to get a tourist bus ticket but it was such a lovely day we decided to explore Budapest on foot instead. We walked across Pest to the banks of the Danube, crossed the historic Chain Bridge and took the funicular railway up to Buda Castle on the escarpment overlooking the city. We reached the top just in time to see the changing of the guard, which in our opinion was a bit showy and not as precise as the English version. We had a good look around the castle precinct, stopped for coffee and cake in a 200-year-old café and then walked back down to the river and across town back to our hotel. The combination of a time change and the colder climate caught up with us and we were glad to get back to the hotel to warm up and rest before heading out for dinner at a restaurant we had earmarked earlier. The waitress recommended a local dish of pork, bacon and wild mushrooms, cooked on a potatoes cake and covered with melted cheese, sour cream and raw onion; it was served with a side order of soused cucumber and sour cream and was delicious but incredibly filling. Next day we explored the Pest side of the river just enjoying the architecture and walking in the fresh air. We stopped for coffee and cake (there seems to be a pattern emerging here) in the lobby of the Four Seasons hotel, a beautiful Art Decco building with glass ceilings. From there we walked along the riverside towards the Parliament pausing to look at a work of art called ‘Shoes on the Danube’ it took the form of 60 pairs of shoes in 1940’s fashion, cast in bronze and positioned along the quayside, they commemorate 60 men women and children who were shot by the Nazi’s left to be carried away by the river. It was a simple but powerful memorial. Walking the streets until mid-afternoon worked up an appetite, so that night we went out to find somewhere serving Chicken Paprikash, another traditional Hungarian dish which we enjoyed with a glass of local beer. After a good night’s sleep we were up bright and early ready to catch the train to Vienna.